The new tax changes for 2018 have left most Americans (understandably) wondering what the impact will be for them personally. You may have heard things like, “the standard deduction has doubled,” which sounds like a win. But then that is coupled with “personal exemptions are repealed.” It makes it difficult to ascertain if you’ll come out ahead when all is said and done. The new law will most certainly take months to fully digest and much planning will be needed, especially for small business owners. But, there are a few takeaways that are clear-cut and should be noted by most Americans. Note that these changes are effective for tax year 2018. Meaning, tax returns filed for 2017 will not be impacted by the changes. Additionally, many of the changes outlined in the new law are set to sunset after 2025. Tax Brackets: Seven tax brackets remain, though with lower percentages and adjusted ranges as compared to 2017. The top rate is now 37% compared to 39.6%. Most Americans will see a small reduction in their marginal tax brackets, though some individuals and a small subset of married-filing-jointly couples will see higher taxes. See the chart below (credit to www.kitces.com) for a comparison. Note the green bars reflecting a tax rate reduction and red bars indicating an increase compared to 2017 law. You can find your income for comparison on the “x” axis at the bottom. Capital Gains: Short-term capital gains are still taxed as ordinary income, thus will be lower for most. Long-term capital gains and qualified dividend brackets remain the same at 0%, 15% and 20%. Oddly, the breakdowns for these are the old marginal tax brackets, not the new ones. Essentially, this means your long-term capital gains tax rate will be based on your income level rather than the bracket into which you fall. Additionally, the 3.8% Medicare surtax on net investment income remains. In summary, personal exemptions are removed, but standard deductions are doubled and there is an expansion to the child tax credit. The chart below (credit to www.kitces.com) shows the impact of the first two changes. You’ll see that the doubled standard deduction is in excess of the old standard deduction combined with personal exemptions. This means that most individuals and couples who have utilized the standard deduction in the past will come out ahead. Personal exemptions which for 2017 offer a reduction to income equal to $4,050 per person per household, have been repealed. 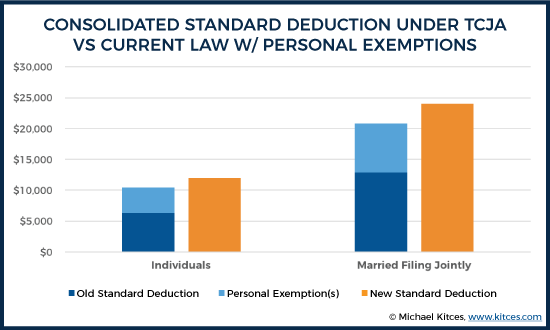 Standard deductions have been doubled to $12,000 for singles and $24,000 for married couples filing jointly. As only an estimated 30% of taxpayers typically itemize deductions, it is likely that very few will itemize in 2018 and beyond. Thus additional changes to itemized deduction rules are not as impactful when considering the new standard deduction levels. The Child Tax Credit (for children under the age of 17) has been doubled from $1,000 per child to $2,000 per child. Although this credit has a phaseout, the levels have been significantly adjusted, allowing individuals with income up to $200,000 (increased from $75,000) and couples with income up to $400,000 (increased from $110,000) to participate. There is also a $500 credit available for dependents who are not qualifying children (such as college-aged children claimed as dependents and dependent parents). As you digest these changes, be sure to note the difference between a deduction and a credit. Again, as less than 1/3 of taxpayers currently itemize deductions, it is estimated very few will itemize beginning in 2018 as the standard deduction levels will double. I’ve seen numbers indicating only 6% of taxpayers will itemize in 2018 and beyond! Nonetheless, for those who expect large medical expenses, plan to purchase a home, etc., there are several itemized deduction changes to be aware of. Also note there is no longer an income phaseout for itemized deductions since the Pease Limitation has been repealed, which can be impactful depending upon your income and deduction level. State & Local Income and Property Tax (SALT) Deductions: There is now a limit of $10,000 for all of the following combined: state & local property and income tax deductions. This applies to both individuals and couples. Mortgage Deductions: Interest on principal of up to $750,000 for new mortgages will be deductible (down from $1 million). Existing mortgages are grandfathered in. Note that there are complexities relating to the deductibility of interest from a home equity line of credit (HELOC). If you have a HELOC, talk to your tax professional. Medical Expense Deductions: The 10% of AGI (Adjusted Gross Income) threshold for medical expenses is temporarily reduced to 7.5% of AGI retroactively for the 2017 tax year and for the upcoming 2018 tax year. After 2018, it reverts to the 10% threshold. If you have medical procedures/expenses you’ve been putting off, this may be a tax planning opportunity. Meaning, if you anticipate out-of-pocket expenses that, when combined with other itemized deductions, would exceed the new standard deduction limits, it would behoove you to lump together those medical expenses in 2018. Miscellaneous Itemized Deductions subject to the 2% AGI floor are repealed. This new provision has a lot to unpack. If you’re a small business owner, talk to your tax professional to begin to understand the potential impact of the Qualified Business Income deduction on your business and any planning opportunities that may be available. For qualifying individuals, this provision will allow a 20% deduction for pass-through income, effectively requiring you to only pay taxes on 80% of your applicable income. There are many complexities and some restrictions associated with this provision, thus working with your tax professional to understand your options is of utmost importance. Note that it may take well into 2018 for tax professionals to fully understand the planning opportunities presented by this deduction. Maximize medical expenses in 2018 if you’re able. Remember that for 2017 and 2018 only, thresholds are lowered to 7.5% of AGI from 10%. Thus, consider “lumping” medical expenses together in 2018 to optimize this deduction opportunity. For 2018 and beyond, consider “lumping” itemized deductions where able. In addition to medical expenses, consider charitable contributions. For example, if you plan to give $10,000 per year to charity, consider giving $20,000 in 2018 and none in 2019, thus achieving your goal of $10,000 per year and allowing you to itemize when combined with your other deductions. Donor-advised funds are a very helpful tool for this strategy. They allow you to contribute the $20,000 at one time to take the deduction in one tax year, but you can distribute the funds to charity according to your timeline—say $10,000 in 2018 and $10,000 in 2019. Talk to your financial advisor or tax professional to determine if this strategy may make sense for you. 529 Education Savings accounts can now be used for elementary and secondary school expenses (as opposed to solely higher education expenses). This is a potential area for immediate planning. The estate tax exemption amounts have been doubled to $11.2 million for individuals and $22.4 million for couples. While the estate tax exemption was already high enough to prevent most estates from paying federal estate taxes, these changes are estimated to reduce the impact of taxation to less than 5,000 estates per year. Stay tuned as guidance from the IRS is given relating to these new laws. Additional areas of planning will very likely be presented in time. 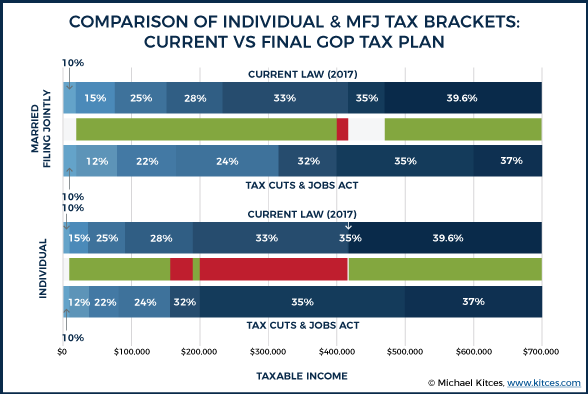 Much appreciation to Michael Kitces (kitces.com) for his thorough review/summary of the Tax Cuts and Jobs Act of 2017.